Tick Talk » You broke what? So, as a watchmaker you get to see all kinds of strange stuff. Lots of odd stuff is the result of previous watchmakers, but this one, I think, is not. I do have to wonder how this happens. Look closely at the photo. The mainplate is broken. The pilot hole for the stem is tilted and has separated from the rest of the mainplate. I don’t know how that happens. I considered taking this mainplate to the laser welder to weld it back together, but given that the original mainplate is available . . . I ordered a new mainplate. Somebody must have torqued that crown really hard to break the mainplate! Oh, well, I will fix it. The black line shows the axis on which the setting wheel post should lie. The red line shows the axis on which it does lie. The circle emphasizes the point where the break occurred. All the customer knew was that the watch would not wind or set. Well, of course not with gears tilted at funny angles and a stem that will wobble excessively these functions are not going to work as intended. 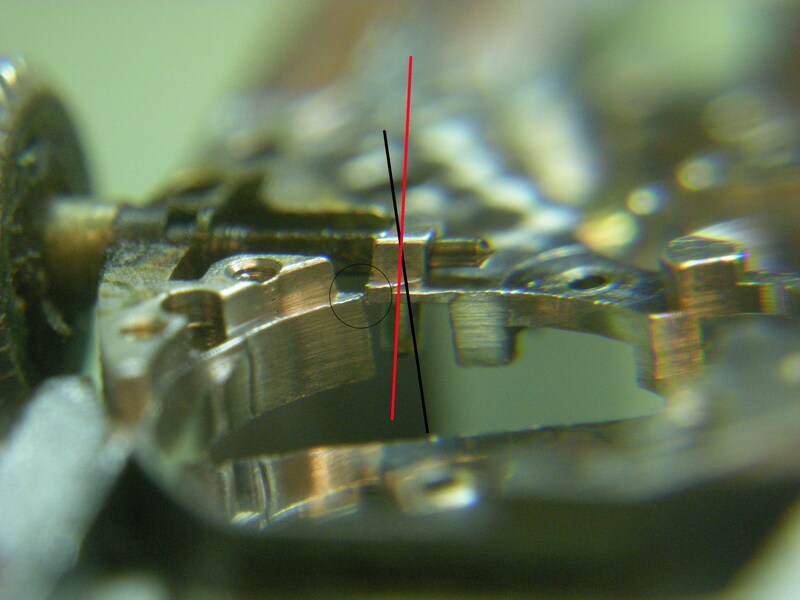 This entry was written by Jordan Ficklin and posted on April 24, 2012 at 9:40 pm and filed under watchmaking. Bookmark the permalink. Follow any comments here with the RSS feed for this post. Post a comment or leave a trackback: Trackback URL. maybe all manually would watches should have the stem at this new fancy angle, so that the crown sits slightly higher on the case. This would put less stress on he bracelet when winding. It would have been useful in the old watches with gold integral mesh bracelets. Looks, almost, as if some sort of sideways force was applied to the crown. Like he caught it on something and pulled, or banged it on something. I’ve seen cheap main plates brake in that way. Usually from a door jam, or counter top. not much material there to begin with. bit of a design flaw if you ask me. I’d also bet that the customer knows EXACTLY how it happened, but didn’t feel like admitting it. Discussed this with my colleague, she has seen it before. When the watch is dropped and lands on the crown, or when the watch is on a table crown down and something drops on it really heavily from the opposite side.